Just a quick one from me today to share my Christmas Day Makeup Picks which I guest posted on That Belle Makeup earlier in the week. Make sure you check out her blog and thank you Lee for having me on to guest post! I start with my trusty Nars Sheer Glow Foundation (£31), which is medium coverage and so easy to blend in and build on. The finish is Satin, so reduces my shine without making my face feel too matte or drying. It's also super long-lasting, which is great for long day. After this I use my current go-to concealer pairing. The Urban Decay Naked Skin Concealer (£17.50) is such a great all-rounder; it's a medium-full coverage that's light and fluffy enough to eliminate both blemishes and dark circles. To brighten up the under-eyes, I go for the concealer-highlighter end of the Charlotte Tilbury Mini Miracle Eye Wand (£29). I usually blend it in with the Real Techniques Setting Brush and it really does do an amazing job of lifting my eye area. For a bit of festive sparkle on my cheekbones, I reach for my Becca x Jaclyn Hill Champagne Pop Shimmering Skin Perfector (£30). It's a gorgeous golden-champagne with a hint of peach that's pretty much my perfect highlight shade. I've seen this colour work on so many different skin tones and now it's available through Space NK, so I definitely recommend checking it out. The formula is so soft and creamy, it blends effortlessly and seriously packs a punch in terms of pigmentation. Next I apply a bit of my holy grail Hourglass Ambient Lighting Blush in Mood Exposure (£28). I bang on about it all the time but it really is the perfect blusher formula; it's so creamy, surprisingly pigmented, applies and lasts like a dream and gives a lit from within look without a speck of glitter. The plummy mauve colour is just perfect for winter too. For eyeshadow, I think the Max Factor Excess Shimmer Eyeshadow in Bronze (£7.99) is perfect. It's shimmery and in a gorgeous deep chocolate-brown shade and can be applied in one quick swipe across the eyelids. Pretty much my perfect everyday formula is Benefit's Roller Lash Mascara (£19.50). It isn't going to give you crazy amounts of volume but it adds serious length and holds a curl throughout the day. Finally I finish off with Bobbi Brown's Sheer Lip Colour in Carolina (£20). On Christmas Day you probably don't want too much of a fussy lipstick considering you'll be eating and drinking a lot! Carolina is a rosy berry shade that feels festive but the sheer formula means it isn't too much and is very easy to re-apply. 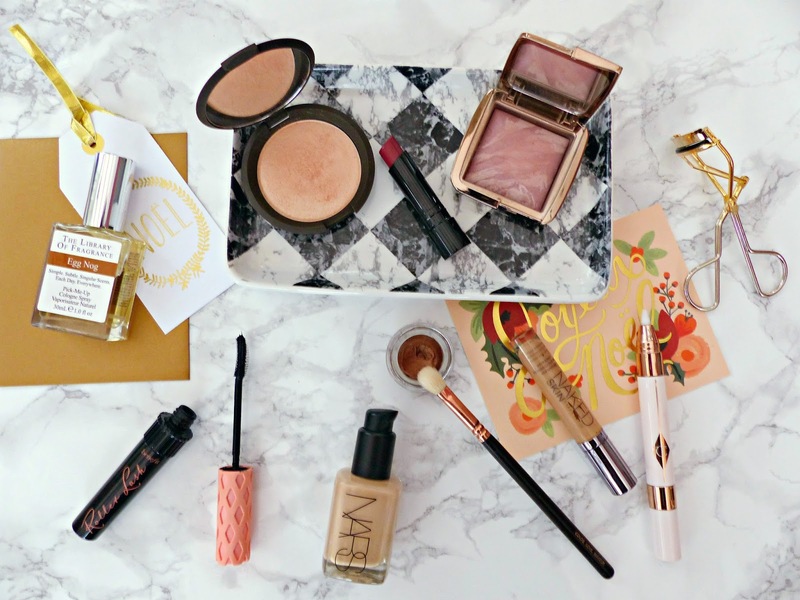 What makeup will you be wearing on Christmas Day? and check out Lee's blog here! Amazing! I love how you've not complicated it too much and kept it fairly quick and simple - no one wants to waste hours doing makeup on Christmas morning! Sounds like a lovely Christmas look - I really want to try the CT Mini Miracle Eye Wand, looks so good! I love the eyeshadow, that's such a festive colour! I'll definitely use my Nars Sheer Glow Foundation as well. Other than that, I'll probably use my Too Faced Chocolate Bar for my eye makeup. Everyone seems to be going for a variation of a red lip, I'm slightly jealous because I cannot pull them off. Carolina does look like a gorgeous shade! I will probably do something simple like no eye make up (except for mascara and maybe a bit of brown eye pencil) and a red lip. As much as I love wearing red lipstick I don't do it anywhere near enough and Christmas is the perfect time for it. Carolina looks like such a gorgeous colour! I've heard so much about the Max Factor excess shimmer eyeshadows but haven't bought any, bronze looks so pretty! I think I will probably go with NARS Sheer Glow too! I love the sound of this look, and love love the look of the Hourglass Ambient Lighting Blusher you have. 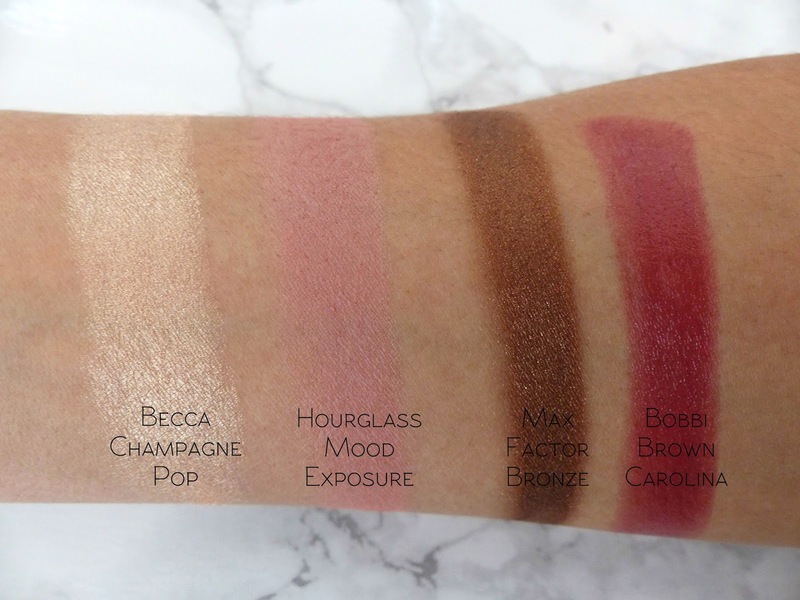 I have been debating about buying a powder and blusher for a while now, and I definitely think Mood Exposure would have to be the one I purchase. I'm yet to try any of the hourglass powder formulas but I cannot wait to pick one or two up, they're near the top of my wishlist! That Max Factor Bronze shade looks beautiful, not too shimmery and it seems like it's really pigmented too. I love Benefit's Roller Lash, it's so great! Really want to try out the Nars foundation! Gorgeous picks! Of course you cannot go wrong with a trustee red lip on Christmas day and that Bobbi Brown one looks lovely!